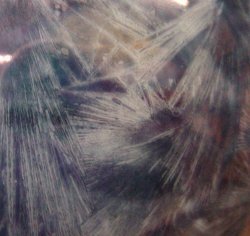 Crystal Magic is a product that dries to creates a Jack Frost pattern. 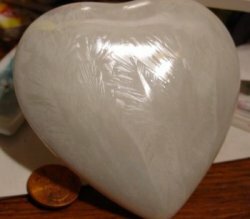 It can be used to get lots of interesting effects and can either be fired or left unfired. The bowl on the left shows the basic Crystal Magic effect with 3 colors of luster...violet, turquoise and rosey red. The lacquer base of the CM is flammable .Dont use near an open flame or cigarettes. CM has a very strong odor ( strong mothballs) until it dries completely . Avoid inhaling the fumes. Work in good ventilation. Avoid getting CM on your skin. Wash with paint thinner, lacquer thinner or my non-toxic Orange Brush Cleaner and then soap and water . Read and follow carefully. Your sucess with this product depends on following the directions. Apply a good , heavy flowing coat of CM to the piece. On a small piece, I use Q-tips or cotton buds , on larger pieces, I use a cheap camel hair brush . ( It doesnt matter if the hairs fall out. It wont affect the CM patterns. ) The coat needs to be thick enough to flow so I literally let the brush get dripping wet. I sometimes pour the CM onto the piece and spread it around with the brush. Don't spread it thin ... and dont keep playing with it. I apply it in bold, crosshatched strokes as quickly as I can. Dont do small picky strokes and dont go over and over it. That will result in small, unremarkable crystal patterns.Dont worry if you miss spots. You can come back after the CM starts to make the patterns and re-apply some in any areas you might have missed .. or in areas where you dont like the pattern. If CM drips onto areas you dont want it on, you can clean it up with any of the solvents I recommended, but the easiest way to do it is to just let the CM dry and then scrape it away with a razor blade. Set it aside to dry . As it dries, it will form the crystal patterns all by itself. You can either clean the brush with paint thinner, lacquer thinner or my non-toxic Orange Brush Cleaner . I usually just put the brush into a couple of zip lock plastic bags to contain the smell and let the brush harden. When I want to use it again, I just put it back in the bottle of CM and in a minute or so , it will soften back up. Working quickly before the luster dries, take a paper towel and wipe the luster back off again. You will think you have wiped off every bit of luster that you put on but the CM pattern is a deep pattern and the luster is actually on heavier than you think it is.. If you dont do this wipe-back-off step, the luster will be too thick and will powder off after firing. Because you will be wiping the luster off again, I leave spaces when I apply the luster in the first place, knowing that I will be rubbing the luster into those places with the paper towel.. If you dont cover all the areas after wiping with the paper towel, then simply re-apply more luster in those areas. 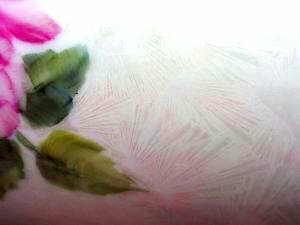 *** If you are working on a large piece, like a vase, where the luster might dry before you completely cover the piece, then apply the luster in sections , wiping each section with the paper towel before going on to the next section. You dont have to worry about leaving seam lines in the luster. It will all blend in. Once the piece has been fired to 017, you can then refire the piece to whatever cone you choose .. and it can be refired as many times as you like to add other effects ( gold, structure paste, etc ) ...but the initial fire with the CM is only 017. The effect you get will depend on the luster you use. ( See color samples below ...click on pictures to see larger version) Mother of Pearl and Mardi Gras-type pale lusters will give you an effect that resembles the inner glow of a quartz crystal. It is a subtle effect and it wonderful for adding delicate texture to a background. To get a more dramatic effect, use a darker luster. NOTE: If the Crystal Magic gets on an area you dont want it to be on , you can wipe it off with a paper towel with either paint thinner, lacquer thinner or my Non-Toxic Orange Brush Cleaner but the easiest way is just to let it dry on the piece. Then use a razor blade or sharp palette knife to scrape it off . This shows the effect of Mardi Gras or Mother of Pearl over CM when the light catches it. The adorable little guy on the left is one of a pair of ornaments painted for me by my good friend ,Alice Wofford. She painted the face with china paints and fired it. She then applied a coat of CM . After it dried, she applied Mother of Pearl, wiped off the excess and fired to 017. You can see the subtle crystalline effect and you can see the paint through it. With CM/ MOP , you can paint either over or under the CM effect.The effect is more pronounced as light hits it. The piece on the right is a close up of a rose vase that I will detail a little further down this page. The closeup shows the CM/MOP effect on the background of the piece. 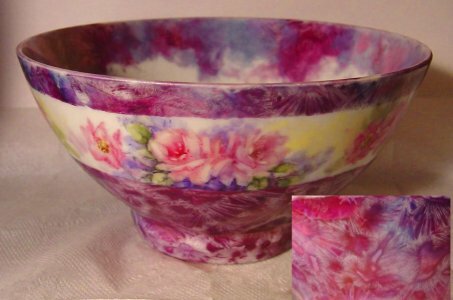 The carmine and purple rose bowl at the top of this page shows the effect of 3 different luster colors marbled over CM . To get this effect , follow the basic CM directions up to #5. ***** NOTE ABOUT LUSTERS FOR THOSE UNFAMILIAR WITH THEIR USE: To avoid contaminating one bottle of luster with a second luster color, be very scrupulous about keeping each bottle and each brush or Q-tip separated. I label the lids of my luster bottles and use a different Q-tip for each color. If I dont remember which luster color I used with that particular Q-tip, I get a new one. Using a separate Q-tip for each luster color, apply the lusters in patches of color... You want to do areas rather than streaks. Leave white spaces showing to have room for the colors to mingle. Wipe the piece with a paper towel. This will both remove the excess luster and marble the colors at the same time. When I saw these little T shirt ornaments at Maryland China (marylandchina.com), I immediately pictured them with CM to create a tie dyed effect. 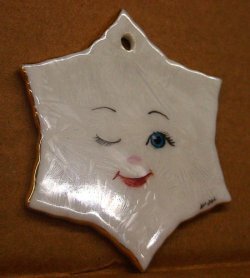 I applied CM over the front side of the ornament and waited for it to dry . Then I applied CM to the back side and waited for it to dry . I then applied yellow,blue, turquoise, rosey red, violet and green luster in bands and carefully wiped with a paper towel so as not to mingle the colors too much . Once the lusters were dry to the touch , I turned the piece over and did random luster patterns on the back side and wiped with a paper towel. < The piece was fired to 017. Because CM and luster dries quickly and will not show fingerprints, you can apply CM and luster to the back of a piece, and then hold it in your hand without worry while painting the front of the piece, enabling you to do both front and back in the same fire. 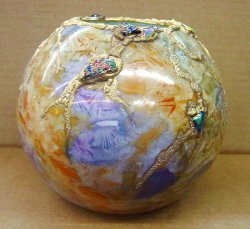 The trick to putting luster on a large piece , like a vase, is to do small areas with the luster, wipe the luster off with the paper towel, then go on to the next area. Continue appying and wiping off the luster in patches until you finish the piece... 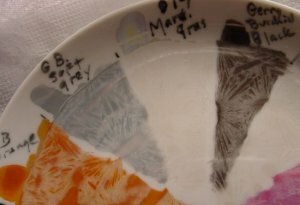 If you try to completely apply the luster on the whole piece , it will dry before you will be able to wipe it off again. This piece was done with CM over the glaze with Orange,Turquoise and violet luster. Fired to Cone 017 ( 1377F / 747C ) Then I mixed structure paste with water and drizzled it onto the piece, embedded some pieces of dichroic glass in the structure and fired the piece to cone 015 ( 1480F / 800C ) . Once the CM has been fired initially to 017 , it can be refired as many times as you like to whatever cone you need because all you have on the surface after the inital fire is luster. 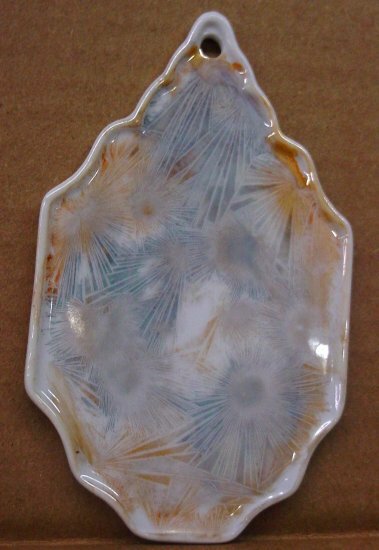 This piece shows that Crystal Magic is equally attractive on a bisque surface. 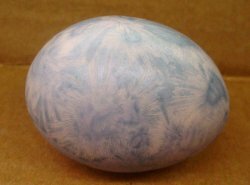 I started with a pink tinted bisque egg. The slip was tinted . I then applied a coat of Crystal Magic according to the basic directions with light blue luster over it, wiped off the excess, and fired to cone 017 . 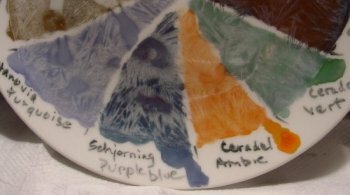 The pink tint of the bisque shows through the blue luster and the luster takes on a soft satiny sheen from the bisque surface. These are some test pieces I did to see what glass paint and china paint would look like over Crystal Magic. On the left, you can see the glass paints. They were applied to the dry CM , wiped back with a paper towel and fired to 017. The effect is very pleasant. 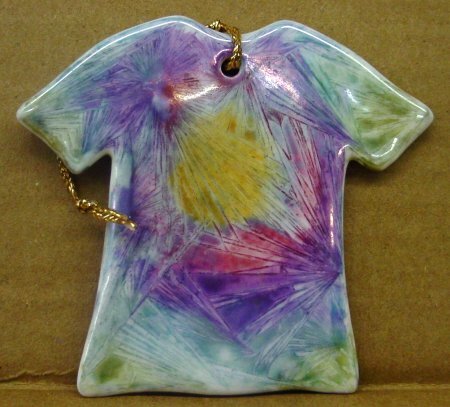 Judy Jaussaud has also experimented successfully with CM and glass paints on white glass. The piece on the right shows CM with regular china paint over it, wiped off before firing to 017.Its a little difficult to see in the photo but the effect is a little clunky in some areas. I am planning to try this on a larger piece because the clunky areas might be interesting on a larger piece, whereas on this small 1 " butter pat, it is overwhelming. Crystal Magic has a very strong mothball odor when you open the bottle because of the solvents. 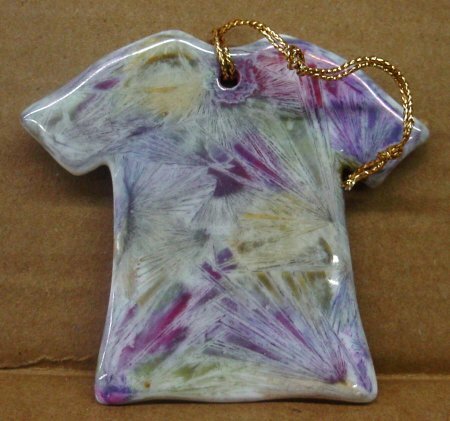 The odor disappears once the solvents evaporate completely , so the Crystal Magic can be left on a piece unfired. This unfired look is most effective over a fired coat of chinapaint and is especially beautiful over fired gold, silver and/or platinum and fired metallic paint. 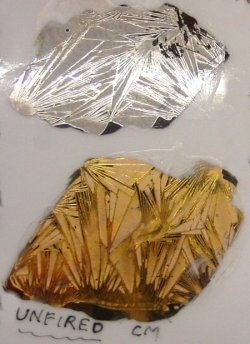 The gold or silver coat doesnt have to be a perfect coat. Apply a coat of Liquid Bright gold, Burnish gold, Roman gold , Silver, Platinum, Metallic paint or china paint on the piece and fire to your normal temperature. ( cone 018/1320F/717 C to cone 015/1480F/800C )Burnish the gold if you are using Roman gold. Then apply CM according to basic directions but dont apply a luster. Just let the patterns form and then leave the CM to dry completely. 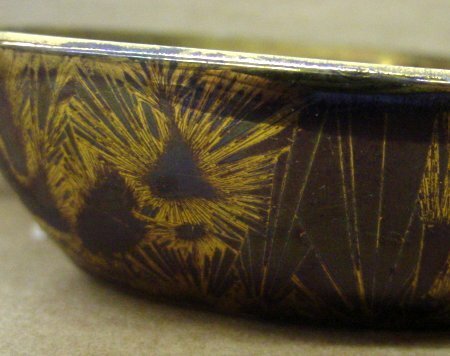 As a matter of fact, unfired CM is a great fix for gold that has come out of the kiln with spots, dull areas, scratches etc. The CM coat will cover the imperfections. The CM coating unfired will stand up to moderate handling and can even be cleaned from time to time with a damp cloth but it can be scratched off with rough handling. If this happens, just re-apply more CM. The effect on the left is CM over metallic gold paint . The metallic gold is available on my Products page. I simply mix it with any medium and paint it on the glaze. I sort of flow and coax it on . The metallic particle take a little gentle brushing to get them to cover completely... Then I fire to cone 015 ( 1480 F/800C ) . Once it is fired, it will have a slightly rough texture. I then put a coat of CM over it as per general instructions. YOu can also apply a coat of dark luster over the dried CM, wipe off the excess luster and fire at cone 017. That is the effect on the right. 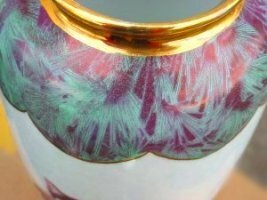 If you look closely at the closeup picture of the vase with the blue, turquoise and orange CM effect, you will notice that you can see that white of the china showing through the crystal patterns.Because of that , you can first paint under the Crystal Magic layer. This is most effective when you have a lot of contrast between the under layer and the Crystal Magic/luster layer...meaning that the under painting should be either gold or a pastel color of china paint fired and the Crystal Magic should be done with a DARK luster. If the luster color and the underpainting are too similar in value, the effect will be unimpressive. To get a dramatic look , you need the strong contrast. The CM effect on the top and bottom of this vase of Boskie and Moof is my favorite Crystal Magic effect. 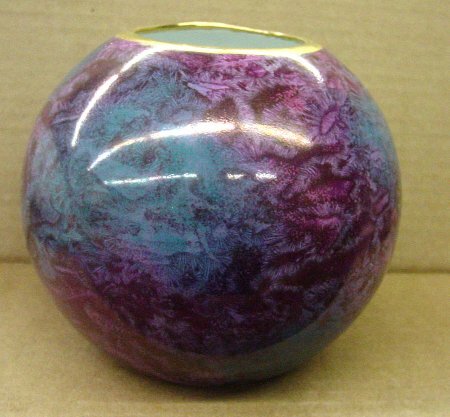 I first sponged on Cool Shadow chinapaint (A soft turquoise color) on the top and bottom of the vase. It's the same color you see on the background of the kitties. 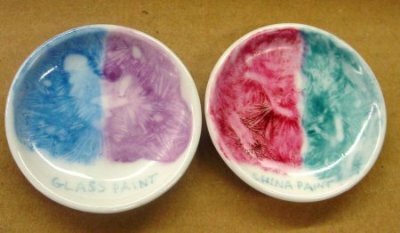 The china paint was fired to cone 015. ( The kitties were also painted at the same time. 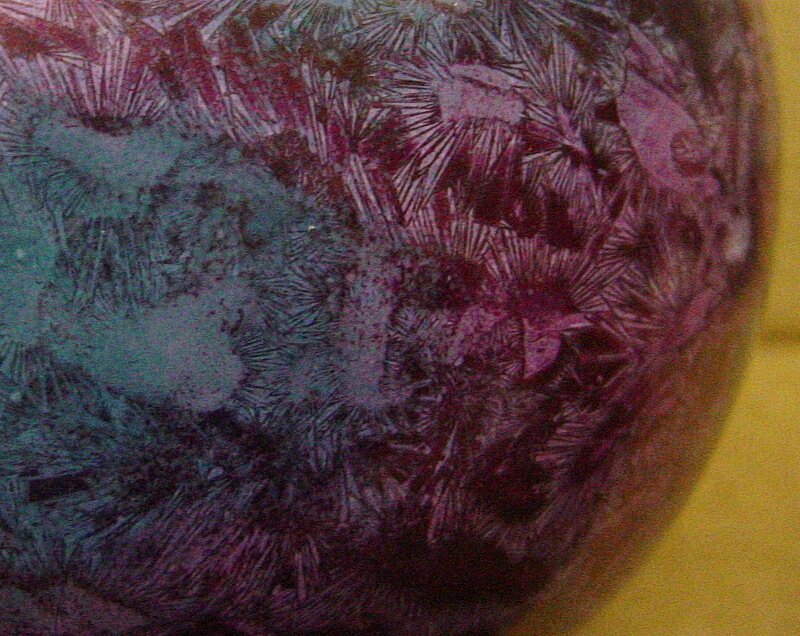 )I then applied the CM according to the directions and used violet luster over it, fired to cone 017. The Cool Shadow shows through the violet crystal patterns. The white parts of the vase have CM with Mother of Pearl over it for an elegant, subtly textured background . These pictures show the effect of CM/luster over fired Liquid Bright Gold. Note that is it difficult to photograph the effect because of hte strong shine of the gold. It's important to use a DARK luster. A light luster ( mother of Pearl, green , etc ) will not be very visible over the gold. 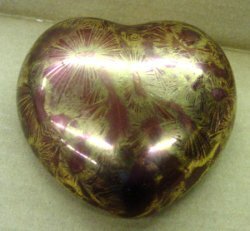 The effect is also beautiful over fired metallic gold. 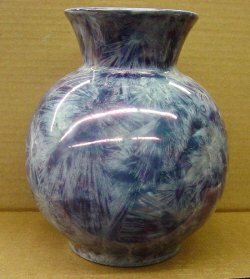 This very artsy vase is amazingly simple to do. I first sponged the vase randomly with Turquoise and Ruby china paint, making sure to keep the colors fairly pale.I fired the piece to 015. The entire piece was then covered with Crystal Magic and then , once it dried, I covered that with violet luster, wiping off the excess. Fired to 017. The underpainted turquoise and ruby show through the violet Crytal Magic layer.